Does your workplace need to be rejuvenated? Do you need to increase compassion, support and recognition? Is moral a bit low? Are your training events designed around the needs of your teams? Are you getting a good return for your money? 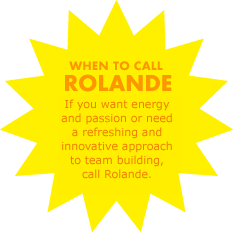 These are all excellent reasons to call Rolande. You will have the tools to survey your team, design the workshops or breakouts that fit your event and monitor the learning progress.